For Thanksgiving, the NY Times posted an article providing a recipe for each of the fifty states. California’s recipe, not surprisingly, incorporated kale, dates, and sourdough bread, and was inspired by California chef Suzanne Goin (try her restaurants, including Lucques, where Patrick and I got engaged). I upped the kale in this recipe, and just slightly decreased the butter. 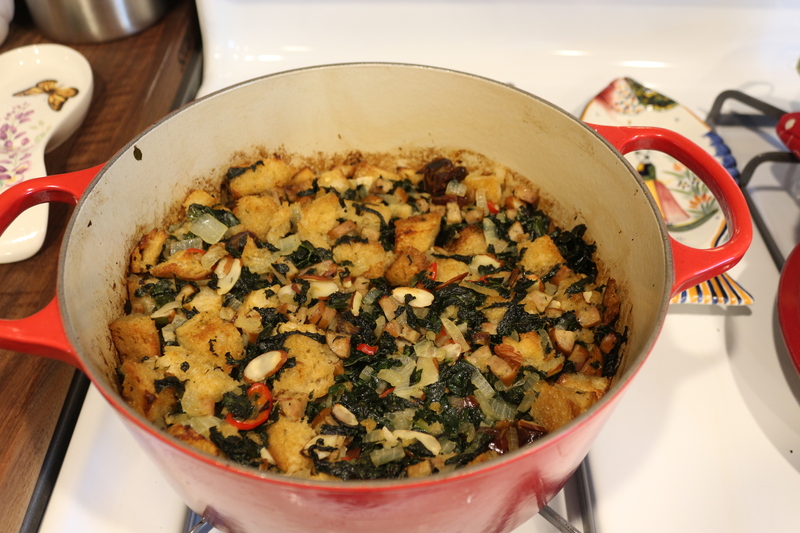 We ended up with a warm bread casserole/salad/mixture that was delicious with the turkey or on its own. 2. Cut the sourdough bread into thick slices. Cut off the crust. Then cut into 1 inch cubes. 3. 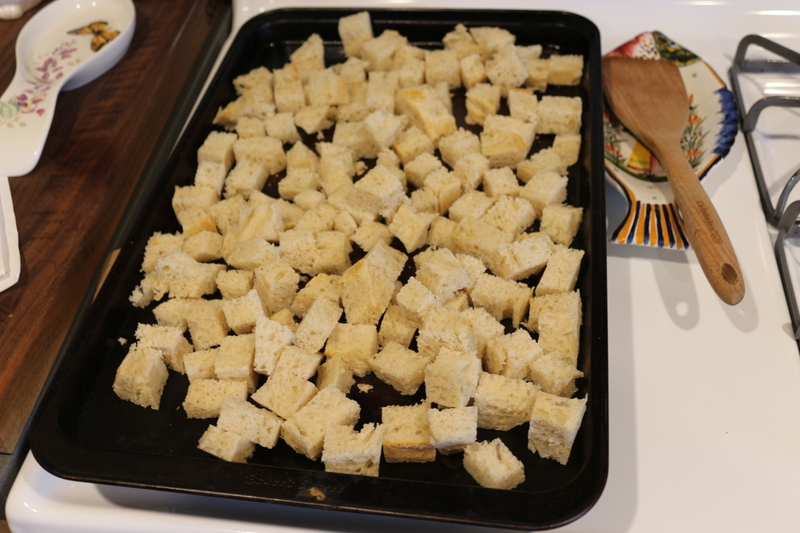 Place the cubes on a large baking dish. Drizzle four tablespoons olive oil over the cubes and use your hands to squeeze it in. Bake for about 12-15 minutes until slightly browned. Place into a large bowl. 4. In a large pot or Dutch oven that can go into the oven itself (I used my Le Creuset), heat 1 tablespoon olive oil over medium-high heat and cook the sausage. If you are doing pre-cooked sausage, cut it up into small diced pieces before cooking. If you are doing fresh sausage, remove from the casing and break up. When cooked, remove from the pan (with a slotted spoon if you did fresh sausage to separate from the fat) and add to the bread bowl. 5. Get the kale ready for cooking. Wash it thoroughly. Remove the leaves from the tough stems. Throw the stems away and roughly chop the leaves. 6. 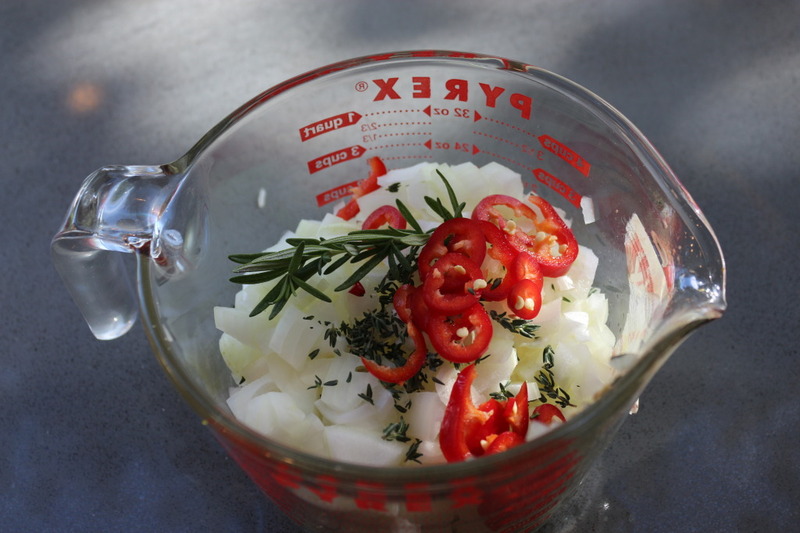 Add 1 to 2 more tablespoons olive oil to you pot and cook onions, rosemary, thyme and chili over medium heat until softened, about 4 minutes. Add the kale and cook until wilted, about 2-3 minutes. If the kale doesn’t fit in the pot all at once, then add half, toss it around a bit until it gets smaller, and then add the rest. 7. Remove the sprig of rosemary and add the kale/onion mixture to the bread bowl. Mix to combine. 8. Cut the dates in half, remove the pits, and cut in half again. Stir into the bread mixture. 9. Return your pot to the stove and boil the sherry on high until it is reduced to about half. Pour in the stock and boil until it too is reduced to about half. Add the butter until melted. 10. Pour the liquid over the bread mixture and stir to combine. Stir in the almonds. 11. Return the bread mixture to the pot and bake for 10-15 minutes covered. Then uncover the pot and bake another 15 minutes until the top is browned. This entry was posted in Mains, Sides and tagged dates, FRUiT, Kale, NUTS, turkey. Bookmark the permalink.